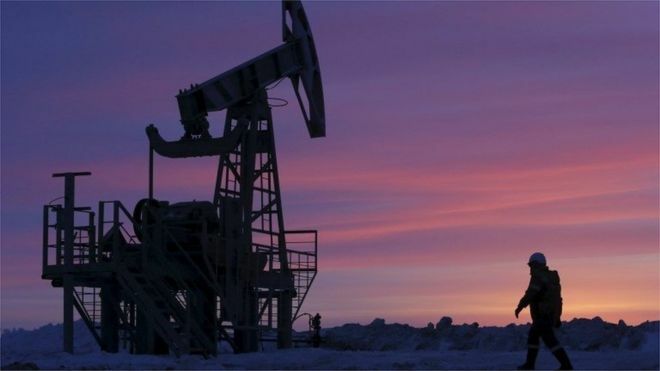 Iran’s Opec envoy is reported as saying it is “illogical” for it to join the oil output freeze agreed by a Russian and Saudi Arabian-led group on Tuesday. Mehdi Asali, quoted in the Iranian newspaper, Shargh, said Iran will continue to increase oil production until it reaches pre-sanction levels. Venezuela’s oil minister is due to hold talks in Tehran to broker a deal with Iran and Iraq on Wednesday. Iran has only just restarted oil exports after sanctions were lifted. The move by four countries, including Venezuela and Qatar, is the first of its kind in 15 years. It is designed to reflate oil prices, which have sunk by about 70% from their recent peak of $116 in June 2014. The plan though failed to convince oil traders. In Tuesday trading the price of a barrel of Brent crude fell by 3.2%. Iraq’s oil ministry is in favour of capping production. It said it was ready to commit to a production freeze if a deal was reached among other producers. But Iran’s Mr Asali said to Shargh: “Asking Iran to freeze its oil production level is illogical… when Iran was under sanctions, some countries raised their output and they caused the drop in oil prices. It aims to raise its crude production and exports to one million barrels a day over the next six months. Two non-Iranian sources close to the Opec discussions told Reuters that Iran could be offered special terms as part of the output freeze deal. There are doubts over the worth of the move. Paul Stevens, from the Royal Institute of International Affairs at Chatham House and an expert on the oil markets, said Tuesday’s agreement had “no credibility whatsoever”. He pointed out that Russia – not a member of the Opec cartel – had reneged on previous production agreements. It last agreed to co-operate with Opec back in 2001, but never followed through on its pledge and raised exports instead. Russia is supporting President Assad’s regime, with help from Iran, while Saudi Arabia as the regional Sunni power is backing opposition forces.